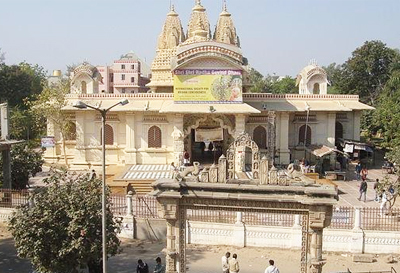 ISKCON (International Society on Krishna Consciousness), otherwise known as the Hare Krishna movement, have established a temple in Ahmedabad as well. 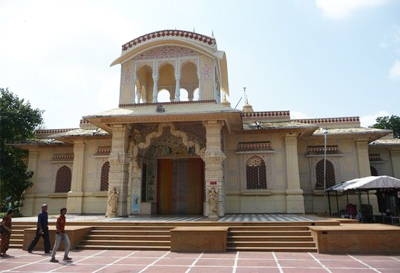 Sprawling over an area of four acres, the architecture of the temple is a harmonious blend of Gujarati Sompura and Rajasthani Khamira style. Well designed by the expert architects, the temple features the largest temple rooms in India, which can accommodate around 4000 devotees. Intricate marble work, beautiful murals, gorgeous columns, exquisite marble floors and designer walls of the temple are all the testaments to the devotion to this place of divinity. 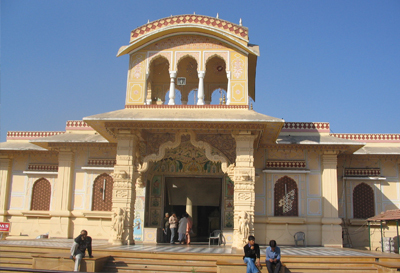 Inside the temple, one can see idols of Radha-Govinda, Gaura-Nitai, Sita-Rama-Laksman-Hamuman, Sri Nathji, Jagannath Baladeva Subhadraji, as well as statues of Srila Prabhupada and Srila Bhaktisiddhanta Saraswati. The ambience of the temple is very attractive, calm and peaceful. Within the temple, one can see a large number of foreigners and Indians draped in saffron and white clothes and enjoying kirtan that goes on for 24 hours. The aura and the trance of the kirtan that reverberates in the air of the temple is powerful and spiritual. Tourists should visit food court, where they can try some scrumptious 'prasad meal', a pure vegetarian meal. Also, there are book stalls, souvenir shops, meditation centers, library and hostels for a stay.